I thought heavily (figuratively and literally) this weekend about whether or not I will be able to do any Christmas baking. My right arm is not able to do much so; mixing, chopping, lifting in and out of the oven etc. so baking may not be on my agenda. Keeping this in mind, I bought a half a slab of Nanaimo bars and had Norm put them in the freezer. 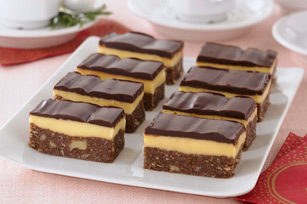 Nanaimo bars are Christmas (and all the time) treats here on the West Coast and since they were on sale I could buy them, right? But what about the peanut butter brownies, tourtiere, cheese balls and mincemeat tarts? Will I have to buy them all? Do I call the girls over to help me make the Christmas Crack (Golden Graham cereal, white chocolate and..OMG!) and non-sexual gingerbread people? I don’t know and I’m already planning Christmas dinner. I’m getting worse every year. I know I can do mixed nuts, with and without shells. But I’m also getting cheaper as I age. Do you know they charge a pound for any kind of mixed nuts? A lot! But I do have to say there is a sense of satisfaction when you crack a walnut perfectly in half. Sigh, I’ll watch the flyers. Then there’s the eggnog, with and without rum. I’ll have to get wee bit more of that, too. People won’t look down on me if I buy already made tart shells, will they? More sighs. Silly things to worry about, right? I love good shortbread and I think there’s a pound of butter in the freezer so maybe I will ask Shauna or Leanne to help or even Norm. The truth is that I’m finding Christmas different from when I was young and when the girls were very young. I still can’t sleep in on Christmas morning, that’s the real reason I make cinnamon buns for Christmas morning. It keeps me busy and not waking up Norm and anyone staying over. I’m glad I’ve written this and I don’t feel as Grinchy as I did. 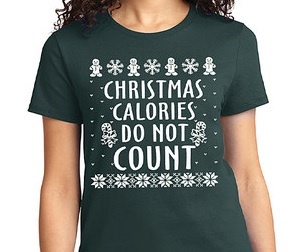 But I will say, “Bah Humbug” just to keep everyone tippy toeing around me. Tee hee hee. I will have slaves and I can live with that even if I don’t make a steamed pumpkin pudding. Cinnamon buns: shape dough into a rough rectangle and lay out on a floured board or counter. Using a rolling pin, roll it out to ½ inch thick rectangle. Let it rest while making the filling. ¼ cup melted butter, ¾ c packed brown sugar and 1-2 tsp of cinnamon. Mix all together and spread onto dough. Roll dough into a cylinder and, using a long sharp knife, cut into 1 inch pieces. Lay pieces into a greased baking pan and let rise. Bake at 375 F until brown on top. Remove from oven and cool. You can add icing if you wish. Glaze: 1 cup icing sugar, 1 tsp vanilla and mix in milk until the consistency of heavy cream. Spread over top, it will drip. Pizza shells: Form into balls and roll out into circles on floured surface then place on baking sheet that is either greased or covered with cornmeal. Top with favourite toppings and bake at 400 F until edge and cheese are brown. ~ by 1fatgirlshrinking - Diane Kirby on November 20, 2014.